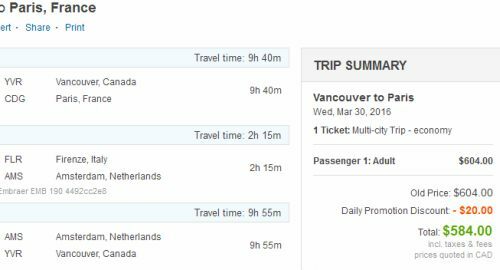 Air France and KLM continue with their very significant price drops from Vancouver to Europe for spring 2016 travel. These price drops are making for some *very* interesting multi-city prices, where you can fly to multiple cities within Europe and still keep the price very low, in the $600s CAD for all 3 flights. Update: There's one date combination from mid June to late June that works too. See below. The price should come up in the $600s CAD for all 3 flights. 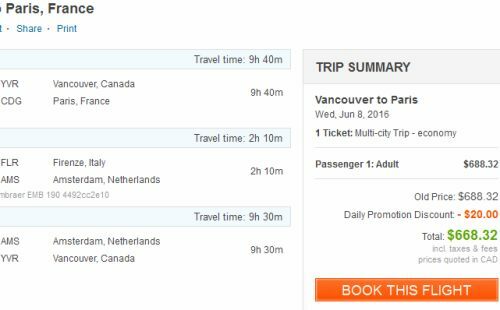 Update #1: November 12 @ 9:30 AM PST - There are some May & June 2016 date combinations showing up on FlightHub for $668 CAD, if you use Florence, Italy for Leg #2 when you search. Search FlightHub the same way you did on Expedia, starting with a 'Multiple City' search. Paris to Zagreb would be the priciest of them all, at around $150-$250 CAD, but considering the fact that Vancouver to Croatia is generally $1200+ roundtrip on it's own, getting there and back (with Paris and Amsterdam thrown in as a bonus) for under $900 is still pretty notable. Barcelona, Florence, and Zagreb are the only ones I've seen that result in a total price in the $600s. Mar 30 to April 13 to April 17 are the dates shown in the FlightHub screenshot, but the other date combinations from above seem to work as well. Join the YVR Deals Facebook Group. vancouver, yvr, flight deals, europe, spain, central europe, western europe, klm, southern europe, southeastern europe, barcelona, bcn, zagreb, croatia, zag, balkans, italy, paris, france, cdg, air france, florence, flr and tuscany. 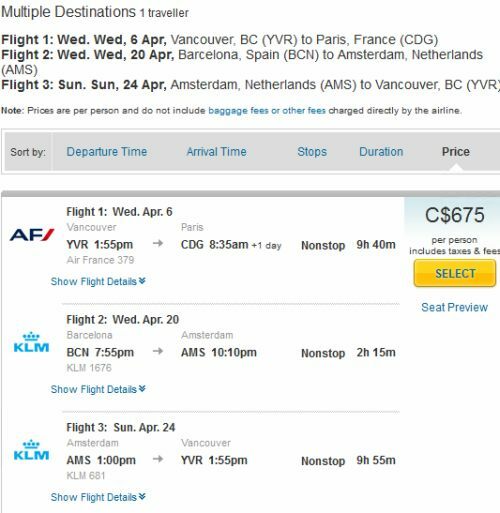 6 Responses to "Vancouver to Paris, and then Barcelona (or Italy, or Croatia) to Amsterdam, and then Amsterdam to Vancouver - in the $600s CAD for all 3 flights"
This look amazing...I understand that the fares are non-refundable but I can't seem to find any details about the charges to make modifications...do you know? Typically most airlines (if you book directly) and third party booking sites (who will pass the airline charges on to you) will charge a significant amount to make changes. $250 + the difference in fare price from when you purchased is common for international flights. Most booking sites and airlines allow free cancellation if it's done within 24 hours or less, giving a person some time to book now and think about it. But Google the policy of the site you're booking through to be sure. Did anyone find similar deals during the middle of March or earlier? We booked out trip for $600 end of April! Thanks Chris!! !